Free bike and skate helmets were distributed at Frank Wagner Elementary School. Photo courtesy of Monroe School District. From a Safe Kids Snohomish County press release. 40 percent of parents say children don’t always wear helmets while riding. Children across the country took part in National Bike to School Day on Wednesday, May 10, 2017. Bike to School Day highlights bicycling and walking to school and supports creating and improving safe routes to school in your community. This year kids at Frank Wagner Elementary took part in this National campaign in partnership with Providence Health & Services, Safe Kids Snohomish County, Fire District 7, Monroe Police Department and Monroe School District. Free bike and skate helmets were distributed along with important safety tips. In addition, the students participated in a school wide coloring and poster contest highlighting safety on the road. The winners took home a brand-new bike or scooter provided by Safe Kids. A new report from Safe Kids Worldwide and Nationwide’s Make Safe Happen program reveals alarming news about the risks kids take when riding bikes, scooters, skates and skateboards. Nearly 40 percent of the 1,600 parents surveyed admitted that their child doesn’t always wear a helmet while riding, even though more than 426,000 children – nearly 50 every hour – visited an emergency department (ED) in 2015 due to a wheeled sports-related injury. The report, “Ready for the Ride: Keeping Kids Safe on Wheels,” explores parents’ beliefs and actions to protect kids while bicycling, scootering, skating and skateboarding. While statistics show helmet use is on the rise, this report uncovers a concerning number of parents who do not require their children to wear a helmet. 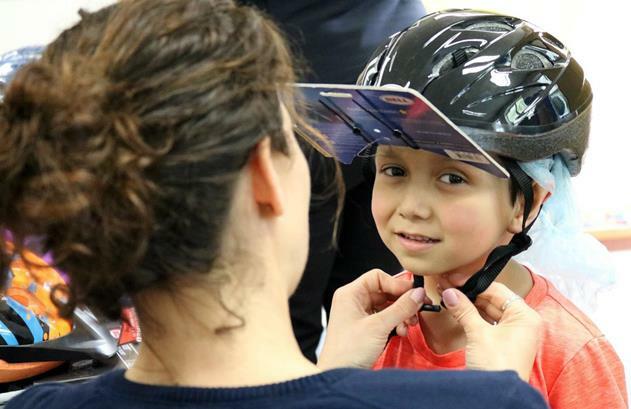 Research shows that helmets and other protective equipment are the best way to prevent injuries while riding, and the new report suggests that more work needs to be done to protect kids at play. “We all want to be able to enjoy the ride with our children, and it’s important to be sure we’re doing so safely,” said Shawneri Guzman of Safe Kids Snohomish County. Between 2005 and 2015, the number of ED visits for bike- and skateboard-related injuries decreased, but visits for skate- and scooter-related injuries increased significantly. In fact, scooter-related injuries shot up by 40 percent over the 10-year period. Worryingly, the survey found that parents were least likely to make children wear a helmet while scootering at only 57 percent. “While it’s encouraging that the bike-related injuries are down, the number of kids still getting hurt is far too high – especially considering that many of these injuries could be avoided by simply wearing a helmet and other safety equipment,” said Mike Boyd, Senior Vice President of Marketing at Nationwide. The report shows a clear need to educate families about the very real injury risks for their children while riding and how to protect them. Why Aren’t Kids Wearing Helmets? Some kids don’t wear helmets because their parents don’t require it. Nearly half of parents said that they or the child’s other parent don’t always make them wear it. Twenty-five percent of parents said that their child simply won’t wear helmets, saying they find them uncomfortable or uncool. Properly-fitted helmets are the best way to prevent head injuries, and ensuring the correct fit of a helmet can increase comfort and use. Are Kids Wearing Other Protective Equipment? Less than 1 in 5 parents of children who scooter and less than 2 in 5 parents whose kids skate said their children always wear knee or elbow pads. Parents of children who skateboard reported even lower numbers, with less than 1 in 3 saying their children always wear knee or elbow pads and less than 1 in 5 reporting they always wear wrist guards. While head injuries are still an issue, the majority of ED visits for wheeled sports in 2015 were for fractures, contusions and abrasions. Protective equipment means more than just a helmet; riders also need to protect their elbows, knees and wrists for when they fall. What Are Kids Getting Injured Riding? Between 2005 and 2015, bicycling injuries dropped by 28 percent and skateboarding injuries went down by 8 percent. However, skating-related injuries went up by 4 percent and injuries on scooters went up by 40 percent. Only 57 percent of parents said their child always wear a helmet while on a scooter, but 19 percent of hospital admissions for scooter-related injuries were because of head injuries. No matter what kids are riding, it’s important for them to wear helmets and protective gear. Injuries can happen on any type of wheels. Most parents surveyed – 9 out of 10 – believe that their community is very or somewhat safe for riding. But among parents who report their child doesn’t always wear a helmet, 30 percent say it’s because the child is not riding in a “dangerous” area. Rural parents were more likely to say helmets aren’t necessary (60%) than urban parents (40%), but research suggests children riding in rural areas are at a higher risk for injury. Even if a child is riding a bike in a driveway, concrete is concrete. It’s important for kids to use their helmets and protective gear no matter where they’re riding. Wear properly-fitted helmets, which are the best way to prevent head injuries and death, for every ride. Ride in safe locations like sidewalks, bike paths or bike lanes whenever possible. Check all equipment at the start or end of every season. Ride together until kids are comfortable enough to ride on their own. The full report includes more detailed findings from the report as well as additional statistics and safety tips. Parents and caregivers are also encouraged to visit www.safekids.org and www.makesafehappen.com for more information.